Do you have all your rows done? I hope so, because this is the final step — the step where we set them all together. You can arrange your rows in any order that suits you, but I’m posting instructions for setting them together in the order I did my own. You will need what I call “filler strips” for this. 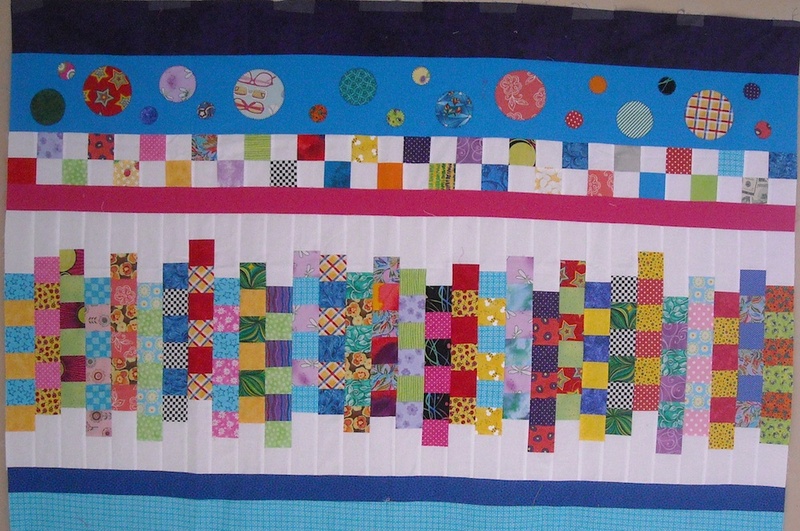 I pieced my strips to get the length I needed for each one, and I used the same fabric in each strip. However, you can piece the strips from various fabrics as well, if you have scraps you’d like to use up. We’ll start at the top. As you’re sewing your rows together, backstitch at the beginning and end of each row. This will help stabilize your top so it doesn’t pull apart while you’re quilting it. For the very top of the quilt, you’ll need a strip 4 1/2″ x 60 1/2″. I made mine from a dark purple fabric. This gets sewn to one of the rows of appliqued circles that you made in Step 1. So choose the row you want to be at the top. I chose the one with the blue background. Sew the 4 1/2″ strip to the top edge of the circle row. To the bottom edge of the circle row, sew the row of 4-patches that you made in Step 2. Set this section aside for now. 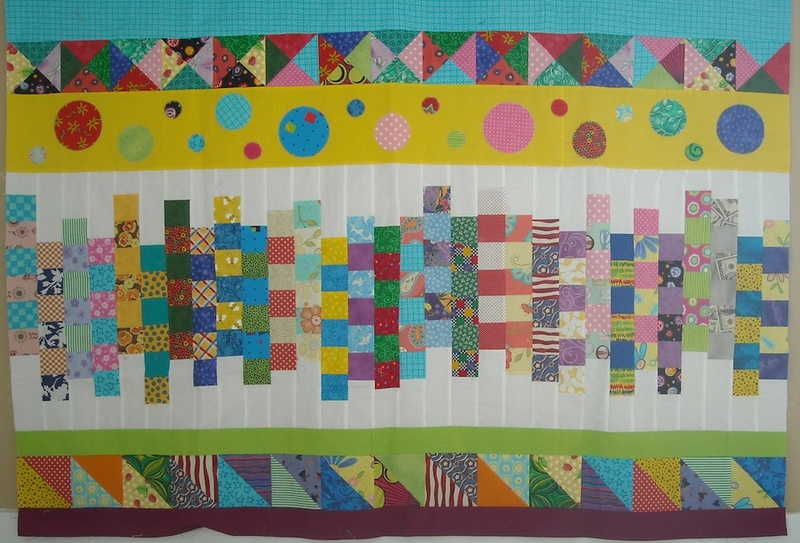 Choose one of the patchwork rows that you made in Step 5 to use next. You’ll need to cut (and piece) 2 strips 2 1/2″ x 60 1/2″. I used fuchsia for one of mine, and a medium-dark blue for the other. Sew one to the top of the patchwork row, and one to the bottom. To complete the bottom half, you’ll first need to cut (and piece) a strip 4 1/2″ x 60 1/2″. Mine is light blue. 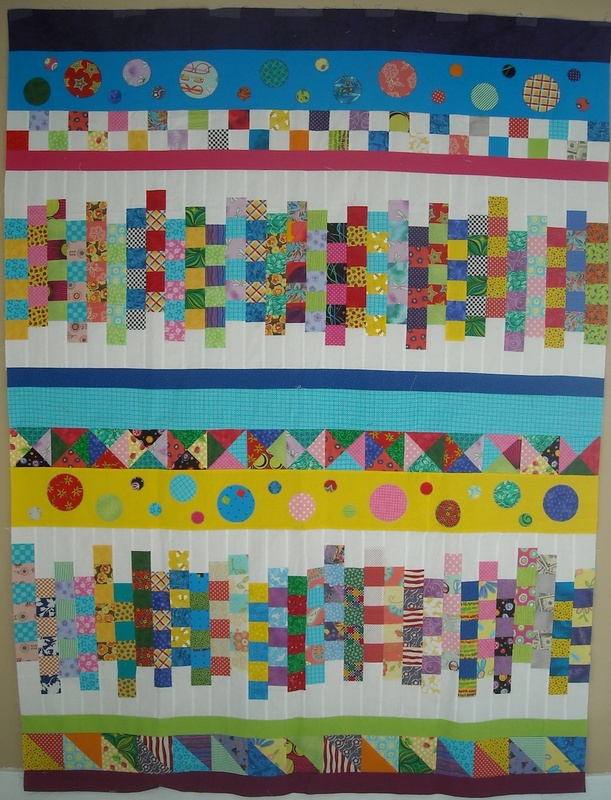 Sew this strip to the top of the Hourglass row that you created in Step 4. To the bottom of the Hourglass row, sew the second row of circles that you made in Step 1. The triangle row that you made in Step 3 should already have strips sewn to both sides of it. Sew this row to the bottom of the second Patchwork row. Join the two halves together, and your quilt top is finished! You’re ready to layer it and quilt it now. I’ll be back next week to show you how I quilted mine, and to reveal what I ultimately chose for binding . . .